Every year, we visit my sister and brother-in-law in Pensacola, Florida. People are always surprised that we don’t go to the beach while we are there. We spent a lot of hours on the beach when our kids were growing up, but now there’s somewhere else that I can’t miss every time I make the trip, and that’s A and E Pharmacy. That sounds really weird until I tell you that they have a quilt/fabric shop on one side of the store. It is quite a nice quilt shop too. They have bolts and bolts of quilting fabric from all of the major fabric warehouses. 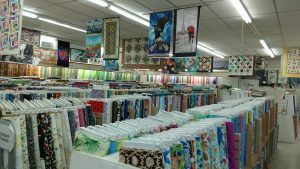 The store has a large wall of batiks and several rows of novelty fabrics. They also carry a good supply of quilt books and some pre-cuts. I could spend hours in there, but my sisters and I try not to take too much advantage of our husbands’ good natures since we stop in there when they are with us. They sometimes will go to gas up the car or run some other errand, but most of the time, they wait somewhat patiently. I always pick up fabric for charity quilts or for quilts to sell because A and E’s prices are reasonable and a little less than some quilt shops and they always have something on sale. Also, the store gives a fifteen per cent discount if you are a guild member. If you’re in the Pensacola area, A and E Pharmacy is not to be missed.